It’s expensive, but also one of the best keyboards you’ll ever use. If you spend most of your days typing at a desk, it's worth looking into an ergonomic keyboard. The traditional flat QWERTY keyboard design wasn't designed with comfort in mind, and really, why should you be forced to live with an input interface originally designed for typewriters in the 1870s? 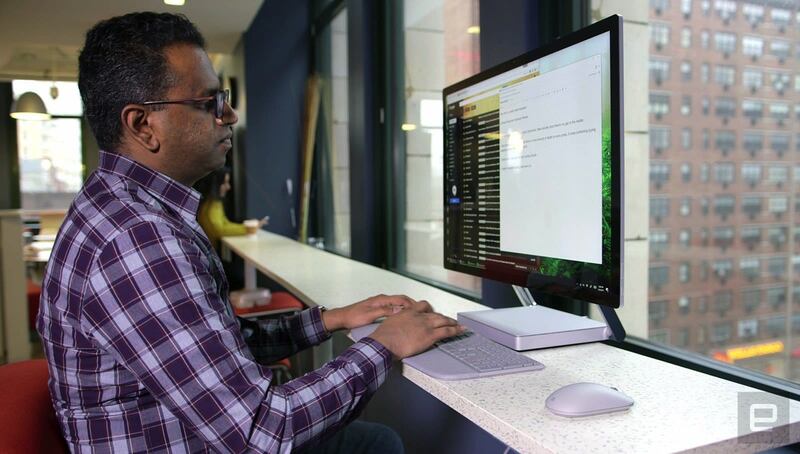 Microsoft has been at the forefront of the ergonomic arena for the past few decades with its "Natural" keyboards, which split the QWERTY layout into two halves to make typing easier on your hands and wrists. And with its new wireless Surface Ergonomic Keyboard, Microsoft has delivered its best model yet. The Surface Ergonomic Keyboard is Microsoft's best natural keyboard yet, and the perfect match for any Surface device. The only downside is that it costs so much. Be the first to review the Surface Ergonomic Keyboard? Strangely enough, this new entry actually looks like a step backward from Microsoft's last model, the Sculpt Ergonomic Keyboard. Whereas that version had a futuristic look, with a large gap between its two sets of keys, the Surface Ergonomic Keyboard is fairly plain. Its light gray styling makes it fit in right alongside the Surface laptops and the Surface Studio desktop (hence the name). But while it looks a tad more traditional, it's also the most refined Microsoft keyboard I've used when it actually comes to typing. Whenever I showed off the keyboard to my fellow Engadget editors, they couldn't help but start fondling its palm rest. It's made out of a soft material that feels smooth and comforting. There's also plenty of cushioning on the palm rest, which should soothe your tired wrists. The keyboard gets its ergonomic badge from its split key design, which cuts the traditional QWERTY layout down the middle. By having your hands rest at a more natural angle (hence the name of Microsoft's early keyboards), the idea is that they'll be less fatigued than if you have to contort them to fit a rectangular set of keys. 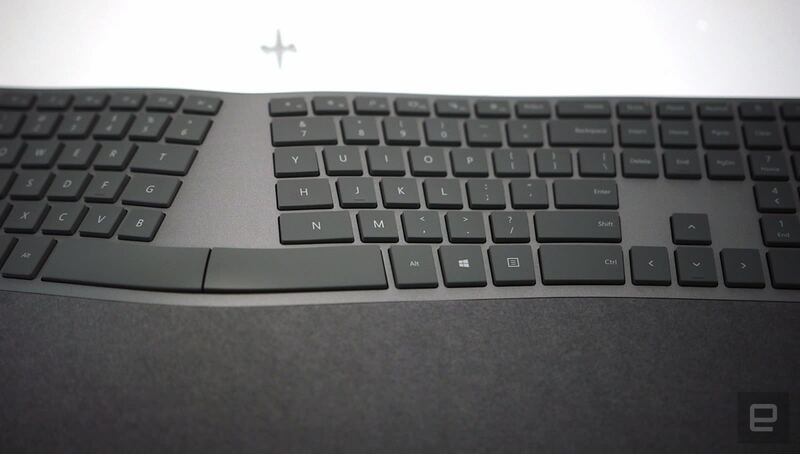 The Surface Ergonomic also has a slight slope to it, which raises the keys slightly. I've used the keyboard to write several reviews and news posts, and I found that my wrists felt less stressed after lengthy typing sessions. For work, I mostly rely on my MacBook Air's keyboard, which is among the better ones on a laptop, but I still noticed an appreciable difference. I've been using these sorts of keyboards for years, so I had no problem getting started with the Surface Ergonomic. But if you've only ever used standard keyboards, it might take some getting used to. Your hands will have to retrain themselves, especially if you're a dedicated touch typist. If you're testing out an ergonomic keyboard for the first time, just give it some time instead of throwing up your hands in frustration. It's worth the work, trust me. My biggest issue with the Surface Ergonomic Keyboard is its high $130 price. I'm used to spending a bit of a premium for a high-end keyboard, but that's still tough to swallow. You could snag Microsoft's Sculpt Ergonomic, which also comes with a mouse, for around $80 today. And for most people, that will feel almost as good as this new model (plus its black design might blend more easily into your hardware). If you're a typing nerd like me who hasn't yet fallen for the siren call of mechanical keyboards, and you don't mind the high price, the Surface Ergonomic is worth a look. And if you do get one, just be sure to keep it safe from jealous desk neighbors.